I Don’t Need an Aviation SMS Database!…or Do I? cobble together single point solutions to satisfy SMS regulators. Why are aviation SMS databases important? 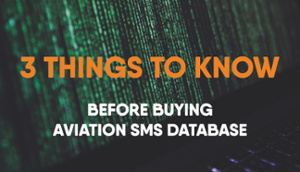 What should an aviation service provider know before running out and buying the cheapest SMS database on the market? lose their certificate (in two to four years based on my experience). setting and monitoring key safety performance indicators (KPIs or SPIs). Based on many years of observations, aviation service providers are not having problems with reacting to events and applying corrective and preventive actions, the problems I see are operators having problems are managing the documentation. As I mentioned earlier, there data management tasks required in an SMS are no joke. documenting results and corrective actions when necessary. SMS is structured process. Operators need help documenting their risk management processes. As they start working the process and documenting their actions, then they will start being able to demonstrate continuous improvement of the SMS. To help safety teams in their search for an aviation SMS database, here are a few things to consider before you throw time and energy into implementing aviation SMS software or building your own. Not every aviation service provider needs an SMS database. I’ll be the first to tell you that some operators should not purchase an SMS database. Their safety culture and management commitment will not support long term data management initiatives. What Is an Aviation SMS Database? As of 2019, the Australians and Canadians are still the ones who most fully embrace the ICAO 2006 SMS mandate. These requirements are explained in ICAO Document 9859. The rest of the world can learn from the growing pains suffered by the Canadians and Australians during their SMS implementations. For those of us that have been following SMS from the beginning, we have been able to identify trends in their SMS implementation processes. Since these two countries paved the “SMS way,” countries following in their footsteps can leapfrog technological hurdles faced earlier by these two countries. “Leapfrogging” is a concept that you may run into during business and economic discussions. The best example that always sticks with me from my college days is the “mobile phone” example. Third world countries adopted mobile phones without having to bear the huge expense of “hard-line” phones. In short, they leapfrogged over the hard line phones and directly adopted mobile phone technology. This leapfrogging allowed these counties to forebear the horrendous expense of telephone poles and tens of thousands of miles of telephone wires. Do not use spreadsheets in companies with high employee turnover, even for small companies with 15-20 employees. There are companies like Sabre and ETQ that actively search to acquire and market point solutions to provide to the aviation industry. These companies don’t generally develop solutions, but acquire point solutions and add them to their stable of software offerings. In a few instances, these companies will integrate multiple point solutions into a single platform or product and relabel the new “integrated solution” under their brand. You may know this as “white labeling.” A white label product is produced by one company and then rebranded by another company to make it appear as if they made it. Point solutions may satisfy a particular business need, but often are not easily configurable to meet unique business needs. This becomes more true with white label SMS solutions because the company marketing the SMS solution doesn’t have the technological ability to easily customize the solution. Another disadvantage of point solutions is that technical and customer support are not as responsive because support tickets are routed from the solutions provider back to the original software developers, and then returns through the same process. This “support ticket routing game” becomes obvious when tech support takes more than a couple hours to contact you with a solution to your problem. If technical support and flexible configuration capabilities are important to your company’s long term data management strategy, point solutions should not be considered. The advantage of point solutions is that they are cheaper than fully integrated databases that have all the features required in a complete SMS database. Most operators don’t need all features in the beginning of their SMS implementations, so a point solution scratches the immediate itch. Point solutions are a short-game strategy. There are valid business cases for adopting point solutions, but if you are a small company with fewer than 60 employees, these point solutions will come back and haunt you in five to six years into your SMS implementation. Larger operators may have available IT resources to integrate multiple point solutions, but if you are a smaller operator, or your IT support staff are overworked, then you should avoid point solutions in your SMS implementation. Point solutions usually have at least one database for each system; therefore, if your company has six point solutions to manage all SMS documentation requirements, then you will potentially have at least six distinct databases to store data. This is not an efficient data management strategy for aviation SMS. Unfortunately, this complexity is hidden from clients who buy an integrated solution comprised of multiple point solutions. To the customer, they are buying “Brand X SMS.” They think they are buying “one product” when in reality, they may be buying 6 or 8 different “white label” products wrapped in a cute package with fancy marketing speak. Unsuspecting customers may not know what is under the covers until years later as they wonder why it is so hard to have a user-friendly configurable system. Is it important that your SMS database provider sells to other industries? Are you concerned about the depth of SMS database provider’s subject matter expertise? These are both valid points to consider. Similar to the white-label software providers, some operators have been re-tooling existing database solutions, such as SharePoint and Spiceworks to serve as their SMS database. We have seen some ingenious hacks using “help desk support software” that was designed to support IT teams. The business argument was that the price was right. This is again a short-game strategy. As we have seen in Australia and Canada, in the early stages of the SMS implementation, safety mangers don’t know what data they are going to collect. What are they going to do with the data once they get it. These safety managers were addressing one implementation point at a time, without the experience of what the end game looks like. It was only years later, usually six to eight years, that accountable executives and safety teams realize that they had an unrealistic picture of the final product – and by final product, I’m referring the fully implemented SMS. automated email notifications from major activities (feedback and task assignment notifications). As you can see, point solutions are great and scratch an immediate itch, but lack long term sustainability. For a long term SMS data management strategy, don’t implement your SMS using point solutions. We have worked with hundreds of aviation service providers in many countries since 2007 as they implemented SMS, or as they re-implemented failed systems. We provide an SMS database built following ICAO’s four components. In short, we have seen hundreds of SMS implementations and we are also SMS data management experts. We are not white-label SMS resellers, but genuine aviation SMS database architects and developers. For the major operators with more than 1,000 employees, these companies have IT support that could either develop their own system or integrate multiple point solutions to address regulatory requirements. These smaller to mid-sized companies also tried in-house solutions and point solutions. Finally, they had come to realize that it is easier, more cost effective and less risky to simply acquire an SMS database from a company that focuses on such systems. After all, you don’t buy an aircraft from an auto manufacturer. Subject matter expertise runs more deeply in a company that dedicates its energies to satisfying SMS data management requirements. From my experience, aviation service providers in the Middle East and Europe didn’t suffer as long as the Canadians in their SMS implementations. This may be due to better training or a better understanding of the data management requirements of these fully developed aviation SMS. If you are an operator in the Middle East, your biggest challenge will be to acquire top management commitment and support to acquire tools to demonstrate SMS compliance. Each geographic region has their own challenges. Luckily, I’ve been blessed by being exposed to most regions around the world. So what does an aviation SMS database offer before, during and after an SMS implementation process? Professionally designed aviation SMS databases can also ensure that operators are following data management best practices. When multiple managers have access to the same data, there is less chance to ignore reported hazards and safety concerns. There is increased accountability and transparency across the organization’s SMS. In addition to best practices, employees become more involved in the SMS when the SMS database is user-friendly and the workflows are logical. There is nothing more of a buzz-kill than a crappy SMS database that doesn’t work or is not user friendly. reviewing SMS manual to align risk management processes to new software. The point is that it is less expensive to choose wisely in the first place. Otherwise your company’s safety culture will suffer for many years to come, unless you get out of the bad relationship within the first year or two. SMS is a structured process. Perhaps the single most important advantage of an SMS database is that it facilitates repeatable risk management processes. Business rules can be enforced to ensure designed risk management procedures are followed according to your SMS manual. This becomes increasingly important for larger companies that are “process driven” or companies with high staff turnover. The SMS database also reduces risk for the accountable executive. They can be assured the SMS is performing in all areas of the organization and alert management when substandard safety performance is detected. If your company needs repeatable risk management processes, and you don’t have time to develop your own, the quick fix is to acquire an SMS database. Some SMS database solutions have an SMS manual template to get new operators started on the right track and to reduce frustrations. SMS manual templates allow safety managers to get a huge jump start on their SMS implementation. This becomes increasingly important when safety managers come to an organization with poorly documented risk management processes. Safety managers without documented risk management processes are grasping for some sort of help, and these SMS manual templates are wonderful because they have well-defined, industry accepted best practices already incorporated in the SMS manual templates. What to Expect from Aviation SMS Software? When we talk about an aviation SMS database, it is important to understand that the database is simply half of the solution. The user interface is the other half. Most safety professionals think that the SMS database and the user-interface are the same. However, if the safety manager has an IT background, the safety manager will realize the database is only used to store organized data in logical tables, like a spreadsheet. To be absolutely correct, SMS software, in most cases, is a Web application. This is a detail that may not excite you, but if you are thinking about buying an SMS database, you will also be getting the front-end where the user interacts with the database using pretty workflows and business logic that prompts you to do something. The Web application may also enforce data restraints, such as required fields, or send email notifications when you assign a task to another user. To us in the IT world, what I described is a Web application, but you may recognize it as a “software program.” There is a database in the back end that stores data. You can think of the database as having hundreds of related data tables. Software (the Web application) accesses this data, either retrieving or storing the data according to security and functional requirements of the software. Easily adaptable when technologies change (such as from desktop to mobile). When you shop for your aviation SMS database, consider your goals and needs. For example, if you are already using SharePoint, you may not need a robust version-controlled document management system integrated within your safety portal. User-friendly charting and graphing tools. Your accountable executive has major responsibilities to the SMS. For starters, they need to make sure their SMS is properly implemented and working as designed across the entire organization. They also need to regularly review safety performance. Whenever problems are identified, either by the safety team or by external auditors, they are responsible for fixing the substandard safety performance. In order to assure the accountable executive that the SMS is performing, you will need tools to monitor SMS performance. SMS performance monitoring dashboards and email notifications (or alerts) afford accountable executives some assurance that the SMS is performing as expected. The alternative is the accountable executive may as well be on another planet, unaware of what will happen to him should a major event occur. The unaware accountable executive will be the one who is not committed to the SMS and will not support the SMS budget for the SMS database. The unaware accountable executive deserves a “spreadsheet SMS” because they are telling the safety team that all he is concerned with is a “paper SMS.” He just wants to check the box. I’ll keep repeating that a “paper SMS” is not always a bad thing. There are business cases that support “checking the box.” However, if your company really is sincere about benefiting from SMS risk management processes, then the accountable executive needs to budget for an SMS database to effectively monitor SMS performance and be able to respond to substandard performance in a timely manner. When it comes to aviation SMS software solutions, the options are virtually endless and are growing daily. Technology constantly changes, so even the existing aviation SMS databases are changing rapidly. Most of the popular aviation SMS solutions are subscription based and some have the option of hosting on your server. With a subscription to aviation SMS database software, the subscription payments are typically monthly or annually. Costs vary by the number of employees or number of aircraft. Operators that focus pricing on the number of aircraft are commonly flight operations specific and their solutions are not as flexible as those that don’t focus on aircraft. There are also some free aviation SMS solutions on the market. Free aviation SMS software may be great for starting your SMS program, but don’t expect to have all the features of a paid subscription. Smaller operators and many governmental agencies without an aviation SMS budget typically sign up for the free aviation SMS subscriptions. Are Aviation SMS Databases Right for Our Company? If your company has more than 20 employees, you should invest in an aviation SMS software program to save yourself pain and misery caused by managing the aviation SMS requirements. Experience has shown that aviation service providers will suffer about eight to ten years of pain before realizing that they need help managing all the data associated with required aviation SMS documentation. If you don’t have top management support, then an aviation SMS database may not be your answer. Lack of top management support is the number one reason why aviation SMS fail. A good rule of thumb is; if your company has 40 or more employees, you will definitely need software tools to manage your data. Otherwise, expect to have audit findings and know that you will suffer repeatedly whenever auditors come calling. Less risk to accountable executive. Which Aviation SMS Databases Are Worth Considering? There are probably three or four aviation SMS software providers that have comparable products. If you Google “aviation SMS software,” you will find the top companies on the first page. Aviation SMS database programs are not that expensive, with some of them as low as $100 per month for smaller operators. Before you purchase an aviation SMS software solutions, make sure the database will be able to grow with your needs. Also, research how the SMS database will help solve your problems when you are implementing your aviation SMS program. Did I mention that we provide an SMS database? After watching the videos above, you may have questions. Sign up for a live demo. No pressure. Published August 2015. Last updated January 2019. For the first time in 30 years, ICAO are set to release a new Annex – Annex 19 – that pulls together current safety management practices and future expectations for facilitating safety risks that exist in our lands and skies. The Annex looks to promote and enhance the alignment between the state and service providers and operators, which in my opinion should be welcomed and can only be a positive thing. Sharing and learning from each other is good, it’s what we are taught as kids and is something we would do well to remember as adults. ICAO have provided us with Annex after Annex of standards and regulations depicting how things should be done in the industry, with lots of references to safety for operation of aircraft, air traffic services, aerodromes, and airworthiness. This new Annex brings together all of these different provisions to further embed safety oversight and systemic risk sharing, but shouldn’t we be doing this already anyway? 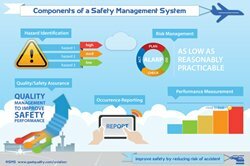 There is a lot of emphasis on the management of safety risks, focusing on what we don’t want to happen, and on the sharing of information. However, how worthwhile the sharing of information actually is depends on what is done with it. ICAO appear to be providing an answer to bridging the gap between simply being aware of other industry incidents and proactively managing and implementing further mitigation strategies to prevent the same thing from occurring on our own watch. But why has it taken a new Annex to be published for us to do this, shouldn’t this be something we should be doing as part of working practice? How do organizations learn and share? It seems ICAO have produced this Annex to show that it is no longer acceptable just to Prevent, Detect and Respond; we need to be able to learn and share information, particularly as the demand for air travel increases. To that end, ICAO has offered greater support for the next generation of safety management systems. The co-ordination effort being established between State Safety Programs (SSP) and the SMS provides an opportunity to improve the performance of the existing SMS to meet state safety policies and objectives, state safety risk management, assurance and promotion. Like I said before, we can no longer be seen just to be preventing, detecting and responding to occurrences. Learning isn’t just about reporting, understanding, implementing and then backtracking; it’s much more than that – learning is the sharing of knowledge and information, so let’s get more information about our controls instead of the outcomes. How about we manage the precursor and build our resilience? Now, it’s all very well saying this but how do we actually achieve it? Well, we need to start somewhere…so how about our controls? Do we have confidence in our controls? If not, why not? And what do we do about it to make sure we are confident in the controls in place? Yes, States play a role to establish and prescribe a State Safety Program in order for us to achieve an acceptable level of safety. However, it is up to the service providers and operators who fundamentally need to demonstrate and actively manage risk and the effectiveness of mitigation strategies through their own Safety Management Systems. So, where do we go with Annex 19? Well, we have to make time to look at what we’ve got; we know an SMS will give us the means to do everything we need to do and to be able do them effectively in terms of manage hazards and associated risks, log incidents and occurrences to be able to report on performance. There will no doubt be policies and procedures with associated workflows that are required to be followed to ensure the investigation is appropriately dealt with. With Annex 19, we need more than this. We need a platform to not only do all the things we need to do, but also all the things we want to do; such as anticipating and predicting, strengthening our position and giving us confidence in our controls. Because if we’re not doing that…well…in the eyes of Annex 19…are we doing it wrong? How does your SMS measure up against the new Annex 19 recommendations? Our aviation consulting services are supported by a network of partners sharing resources and values. We believe in applying the right set of skills and experience to any aviation project, and to deliver right-priced solutions. Our aviation clients benefit by achieving their goals in an efficient and cost effective manner. We consult across a wide variety of clients in the global aviation world on determining the safety and operational integrity of our client’s airline, repair station and airport operations. Our services range from airline safety and operations assessments including flight department assessments, fuel farm and ground services support training, airport security assessments, and technical manual development. Our philosophy is to assist our clients to build closed-loop systems to support all aspects of Flight Operations, Ground Operations, Aircraft Maintenance, Security and Safety. We focus on leadership, communication, problem resolution, continuous surveillance and information architecture to meet an organization’s responsibilities for its safe aviation operations.